With most of the road behind us, the first part of the first day of SXSW found us driving from Denton, Texas down to Austin. The second part found us smack dab in the middle of Austin and then smack dab in the middle of SXSW. I’m going to do our best to gloss over the last part. All in all a great kick off to my first ever SXSW, even though my feet are super sore at the moment. The only way to kick off this day right was with a hearty breakfast and we hit it off right. The Best Western my and my girlfriend stayed had an average continental breakfast plus a waffle iron that made waffles the shapes of the state of Texas. Everything in Texas is all about Texas. I scarfed that down with a breakfast burrito and we were ready for the road. And my, was the road so beautiful. I’m not sure if it was the fact that the weather in Kansas City was consistently dreary for last 4 months, or weather it was a bodily need to feel the kind of sun and warmth we felt on the drive through Texas. The sun was out and it was about 70 degrees. I’m leaning toward a bodily need because my bones felt good with the cool wind and the gentle sun stroking my skin. Spring needs to show up back north real quick. We got into Austin and instantly felt the traffic crush. Sure, the traffic stunk in Ft Worth but we expected that. Austin was mega crowded. Now part of that was the conference crowd, but I think the other part was our lack of knowledge on the area. The crunch of cars reminded us that Austin was a college town as well as a capital city town. Never fear, we negotiated it pretty well and pulled into Mellow Mushroom for lunch. If you have not been to Mellow Mushroom, GO THERE! The pizza was fantastic. Every pizza joint has the traditional fare like pepparoni, meat lover’s, or combination style pies. Mellow Mushroom puts the specialty over the top with it’s choice ingredients. We opten for the Philosopher’s Pie and didn’t regret it one bit. The atmosphere, too, made us feel like we were back in college jamming out to some old records again. There’s leftover in the fridge I’m staring at while I’m trying to type this at the moment and I may just grab it. We paid our tab and hit the hotel. After we unloaded we opted to walk the distance to SXSW. The walk reminded us of the 39th West part of Kansas City. There were lots of tiny knick knack shops and corner vendors pumping out home cookin’ and home fashions. The walk ended up being much longer than what we expected but we made the trip without breaking too much of a sweat. Now on the meaty part of the day. We grabbed our platinum badge, after getting lost and finding our way in the convention center, then grabbed all three of our schwag bags and made off to the registrant’s tent. Because of the traffic and pizza eats, we missed the first two sessions of the day. So we pounded our beers and parted ways to make off to the 5pm events that caught our eye. The registrant’s lodge was just a little to compact and we can see getting worse here in the next couple of days. 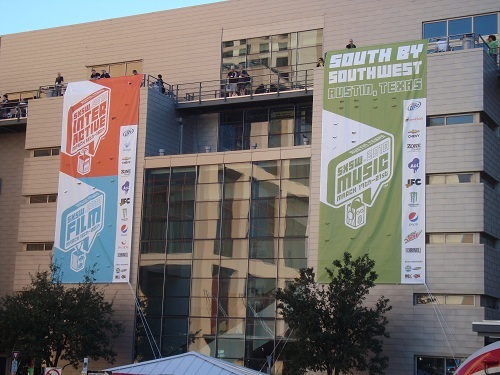 Inside, however, it was easy sailing to my very first SXSW Session. It was a battle between either a design session or a future of communications session. The abstract session won out. My brain wasn’t ready for nuts and bolts so a tasty little big picture thought bounce seemed the best route to take. The session was called Wave and Communications (R)evolution: Better than Being There? It was moderated by Jared Goralnick and featured Casey Whitelaw, Daniel Raffel, and Jay Cuthrell. The talk revolved around three aspects of future communication: The engineer’s building view, the sofwtare manager’s cooking, and the real world’s take on the whole shebang. I liked where the panel was going with their ideas on making communication easier to use and swallow, while giving the power to whoever uses it to chop and cut and mold it to whatever they want. The only problem with the session is that ended being a big Google Wave slam fest. Whitelaw is an engineer on the Wave project and most of the questions from everyone poked at why no one was using Wave as much. A lot of the examples brought up to support why came from other talks or other data. It all pointed to Wave being to much up front and scaring everyone away. They talked about the need to dampen such heavy feature blasting. It also seemed that the panel accepted email as a foothold that was way to strong to upend. Cuthrell pointed to a poll that suggested most managers and CEO’s see email being around for 35 years. Jinkies. The problem I think the panel is missing is the builder’s dilemma. When the builder of a software project, or more broadly, a creative project works toward thier view of the end point of the project, they tend have a difficult time when the user or universe takes that project toward another end point. The builder has a hard time of letting go. When Twitter was made, no one envisioned Retweets to become as big as they did. The users grew it out. Google Wave has yet to find that kind of dilemma because in part, the builder’s want to build in the user growth but also becuase of the admitted issue with up front complexity. The Wave and Communication talk was a good tip of the ice berg for me and now my brain is ready to think in terms of tech here in the next couple of days. My lovely girlfriend had an equally exciting time as during her sesison someone yanked the fire alarm and caused an evacuation in mid session. After the day events, we grabbed another drink at the Registrant’s Lounge then made our way to try to watch some films. We missed out on all the films we wanted to due to long lines, tiny room, and more than 1 1/2 hour line waits. So yeah, we need to work on our line mojo for the upcoming music events. Outside of that, the day was a succes and we are getting our feet under us pretty well here in Austin.